Last summer I made my first Ludum Dare entry, it was in the #36 and the Compo section indeed. It was a great experience and I was amazed by all the feedback I got. And I didn’t want to waste it. These months I’ve been dedicating some free time to adapt and improve the game and I’ve just proudly pubished it today for Google Play. I’ll leave you the link to the game and some related stuff. Entropy, my Ludum Dare 33 Entry, is now a full game ! “Entropy : A Quest for Harmony” is out now on Android ! For Ludum Dare 33, I made a relaxing puzzle game about destroying the universe. It was quite well received and I was very satisfied with the results. The concept was really simple at its core and provided a good base on which to expend and create more content. It took quite a while before I decided to make a full game out of it though. About 6 months later, I started the development of Entropy as a full mobile game. After quick testing, I found that the concept was really intuitive with touch controls. This is due mostly to the simplicity of the controls. I decided to not add any new inputs from the player other than clicking on the shapes to make them rotate. Instead, I added mechanics in the form of interactions between the existing elements and by changing the rules. Now, one year later, the game now has over 60 levels and is available completely free ! I would like to thank everyone who gave my feedback, both on the full game and on my Ludum Dare entry ! Also, I’d be happy to answer any questions about the development you might have ! Color Bug – Colorful Bug’s Adventure! Color Bug is a variation of color matching game specially design for mobiles! Player just have to tap a button while the spinner pass through the marbles to change the Bug’s color. Just match the flower with the Bug! Planned to join any miniLD if have but seems not available right now. 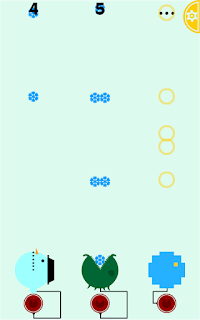 Simple game now available for android platform, feedback is welcome! Happy playing! Moveless Chess – Mobile and full-featured web version coming soon! So, Moveless Chess is coming along really nicely. We are working on a commercial release (iOs, Android and Web) so we’ve decided to make some changes. One of the bigger ones? NEW UI! And this is the new portrait version! You can play the jam and post-compo version HERE. Note: In the following days we’ll be uploading new versions with new levels and new UI. And iOS and Android versions in the upcoming weeks! Post Jam Update… SPEED BLOX VR! taking the time playing our game! the ‘Cool’ Blox obstruct the view of the oncoming ‘Angry’ Blox. Now, all Cool Blox become (semi) transparent once you look at them. Have fun tripping across space-time! Check out our game here! Potion Shift is now on Android! Earth life is so Three thousand and sixteen! Back in 2000, DIV Games Studio was released in the UK as a complete all in one package for creating games (including a graphical editor) and delighted many users who went on to have successful programming careers, including MDickie who currently has literally MILLIONS of downloads on the android app stores. DIV was put to rest in 2005 due to being DOS only, but after 10 years sleep, it is now back and ready to compete with the modern world. you may even be surprised with what we achieve! I Love My Circle is finally going to be released on March 1st for Android and iOS. I intended to release it for the October challenge but it turns out I massively underestimated how long everything takes! Many thanks to the LD community for inspiring me to release a game, I wouldn’t have made it here if it wasn’t for you guys. You can find a presskit() for the game here: http://ilovemycircle.com. I would really appreciate any help spreading the word. After a few months of work I’ve finally released Runners on the Google Play Store, it is my first finished game that I’m actually proud of! It is an endless runner style game with unlockable characters and online leaderboards. It is my first attempt at including online capability such as leaderboards and I’m really pleased with how it turned out! In this game it is necessary to control a positron and avoid collisions with electrons to prevent annihilation. The game is extremely dynamic, quite difficult, requires a good reaction, but the records don’t stop to be beaten. The rating of the game is high and the game itself is in the top among the most trending arcade games. Thank you for inspiration, Ludum Dare! Just swipe the screen and enjoy the snowfall. Now defeat conditions: you can do whatever you like to have fun. The technology I used: Action Script 3/Starling/Air. The game keeps 1000 snowflakes at 60 fps. 24 queries executed in 0.139 seconds.